Books on the table, papers on the couch, clothes on the chair, toys on the floor…sound familiar? The only real way to feel sane is to get—and stay—organized. Feels impossible, you say? Not true! 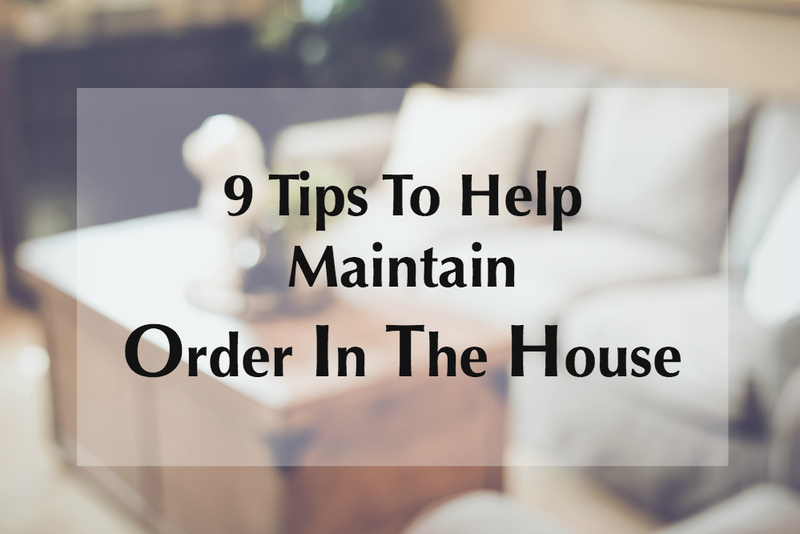 Did you know the goal of organizing isn’t to make your house pristine and spotless, but to help make your life more functional? And who couldn’t use more of that? So in today’s post, I’m sharing 9 empowering tips to help you stay clutter free even if (when) you’re super busy. Be consistently purging and “editing.” I’m always checking my closets and rooms for items I no longer need or use. And when I find them, I donate them. If you keep unnecessary clutter to a minimum, you’ll have less to keep tidy. Every day go through each room checking for items that do not belong there, and putting them where they belong. Even better, try not to ever leave a room empty handed. Take something with you when you leave a space—a dirty dish, shoes, toys, mail, etc.—and walk it to the place it belongs. Got papers everywhere? Consolidate them all into one spot and take care of them from that designated place. Piles in the designated space are fine as long as you keep the categories of piles separated. Having organized piles makes it easier and timesaving to grab what you need when you’re ready to take care of it. Working on a project or two (or more)? It’s best to try and keep all projects contained to one area of your home. It will make getting your work done there more efficient, as well as offer you clutter-free living throughout the rest of your home. Challenged by ADHD? Help keep your ADHD brain in check with self-talk that encourages you to keep tasks brief so you don’t lose interest in them and quit before your decluttering is done. Move all items for donation immediately out of the house. Let’s not add more piles (clutter) to your home. So when you’ve got items for donation, put them in your car right away, and add dropping off at the donation center to your to-do list. Don’t have a to do list? Make one! Don’t waste brainpower trying to keep track of everything that needs to get done each week or day. Write it down so nothing slips through the cracks and piles up on you. Think of the dump/junkyard as your friend—there to help you get rid of unwanted and unnecessary items that are cluttering your space. And if you have concerns regarding filling up the landfill, then you may want to rethink your purchases/acquisitions from the start. In fact, we should all be on the lookout for ways to block unneeded items before they cross our threshold. Reward yourself for completing your decluttering tasks. Maintain the mindset of getting tasks completed so you can play, or at least have the opportunity to do so if/when the opportunity presents itself—guilt-free! I realize that keeping your home organized can seem daunting at times. But often, it’s the smallest steps that make the biggest difference in the end. Commit to good habits now and get that more functional life you’ve been dreaming about.